The kitchen backsplash is the area between the countertop and the kitchen wall. It can also be beneath the cabinetry above the countertops. The kitchen backsplash is not only installed for organizational and cleanliness purposes but to enhance the design theme of the kitchen. They are usually matched with the countertops. It is not necessary to install Concrete Backsplash Tile or Cement Backsplash Tile matching with concrete countertops but it is usually done this way to add more consistency to the kitchen design. When backsplashes are made of concrete tiles, there is more freedom for matching colors, patterns and shapes. 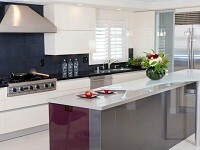 Cement kitchen tiles offer more durability, strength and beauty than any other tile or wood type. When it comes to using concrete backsplash tile, there is an unlimited choice for designing the kitchen as you want. Concrete or Cement tiles offer a wide range of colors and cuts along with better durability and easier maintenance. If you don’t install a backsplash, you may feel like the countertop looks incomplete. It will make your kitchen look kind of dull. Therefore, installing backsplash complementing with countertops will bring your design theme to life. it will create continuity in the design that will enhance the overall aesthetic. It is better to install cement tiles for the backsplash as the countertop to maintain the consistency because one can find countless colors, patterns and styles in concrete backsplashes to make a match with any countertop style and pattern. With concrete tile, you can enjoy multiple benefits and customization of Backsplashes. If you are remodeling your kitchen and want to get rid of the old tiles without much effort, it is better to invest an overlay. The overlay tiles can easily cover up the old tiles and make your kitchen look brand new. The concrete tile overlay can be a good option to resist damage from salt, chemicals, UV exposure, and abrasion. There is not lack of colors and patterns you want to choose from. If you want to bring about natural look to your kitchen, then concrete tile is a good option. The highly customizable nature of concrete allows you to choose organic shapes and colors. The rough edges of the tiles will add to the natural aesthetic of your new or remodeled kitchen. Cement Kitchen Backsplash will stand strong to the wear and tear of routine life, and maintains its naturality and elegance always. Similarly, you can combine multiple design ideas to produce from a concrete backsplash tile. You can bring out the artist in you to make your dream kitchen come true. What is Concrete Backsplash Tile Made Of? A concrete tile is not exactly a cement tile. It goes beyond being just a cement tile with added aggregates that are light in weight and certain additives. Additives may include fiber reinforcement acrylic and silica fume pozzolan. 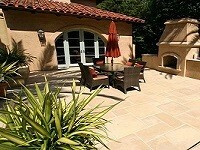 Since it is just not cement, a concrete tile offers various features like durability, easier cleaning and maintenance. With regular cleaning, it is fairly easy to maintain the durability. It is recommended to use clean water and microfiber mop each time. You can mix water with neutral cleansers to avoid abrasion of the tile. For long-term maintenance, it is better to invest in resealing of the tiles when it is required. Westside Tile and Stone specialize in high-quality concrete tiles and cement tiles that can be used to install kitchen countertops and backsplash tile. The company offers a wide range of colors and patterns to suit the customer’s preferences for the kitchen design. With highly market competitive rates, Westside Tile and Stone ensure that the concrete backsplash tile will last longer and provide stunning aesthetics for any kitchen. To know your options in terms of concrete tile for the kitchen, contact Westside Tile and Stone today. The experts will guide you through great options and offer an estimated quote. With countless colors, patterns and styles, concrete tiles from Westside Tile & Stone, Inc. provide an affordable kitchen backsplash tile in high quality material and design option with growing visual appeal. You can create your own design that comes from your own mind or from inspiration or customize design with our design experts help. Contact us today to find out more information about cement or concrete tile backsplash and to completely transform your kitchen into a place that performs for the demands of a routine life.